Registration forms and instructions for non-citizen voters were published on July 16, and Chinese for Affirmative Action has hired 5 Outreach Specialists to get this updated information out to immigrant parents. Non-Citizen Parent Voting is a new opportunity for immigrant parents to vote in the upcoming SFUSD school board election but comes with potential risks. Notably, registering for the election will make your name visible on federal voter rolls which is accessible by immigration authorities. Outreach Specialists will be conducting information and education outreach so that immigrant families are aware of their rights and the risks involved. 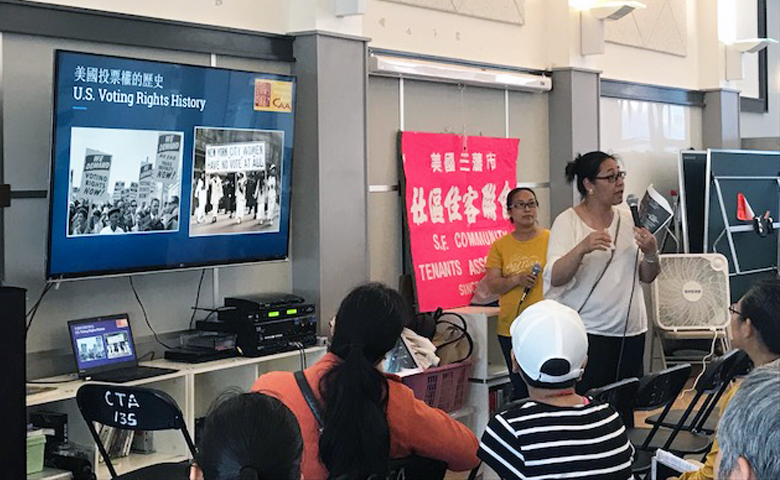 Each outreach specialists is a graduate of our Leadership Development Institute, where immigrant community members participated in a series of interactive political education and skills-building workshops on issues such as voting rights. As a result, our outreach specialists are well equipped to present informed presentations and bring invaluable experience, knowledge, and excitement to our outreach efforts. Between May and July, we have been researching and refining our presentation on non-citizen parent voting in San Francisco. The Outreach Specialists underwent many in depth trainings on immigration history and systems, the risks involved with voting as a non-citizen, and how to speak to journalists. At the same time, we contacted libraries, schools, Single Room Occupancy (SRO) families, and community organizations to coordinate collaborative outreach efforts. The Outreach Specialists are using every opportunity to talk with immigrant parents such as when they are accompanying their own kids at the park. If you are connected to a school or any other institution that serves immigrant families, please get in touch with us so that we can expand our outreach network. Together we can distribute vital, accurate information about this new right to vote for non-citizen parents and encourage civic participation for all.